Having played ESO quite a bit more since my impressions post awhile back, I have had time to really delve into the game a bit more and come up with more that I like and a couple things that I am having reservations about. The reservations are not enough to make me cancel my pre-order but they are things that worry me. One of them is much more worrisome than the other because of the lack of information concerning it. The other one is a done deal and is something I will have to live with in the long run. ESO has a robust PvP endgame. The AvA is well-done thus far. Its fun, runs well and they avoided a lot of pitfalls that Guild Wars 2 ran into with their WvW. The PvE endgame, however, is much more ambiguous and ill-defined. There is very little information out there about what it will consist of and how it will work. Its no secret that I prefer PvP but I was once a pretty hard-core raider. I did the entire 40-man raid gamut in WoW. Molten Core, Black Wing Lair, AQ40, Naxxramas. I did them all in Vanilla WoW. I don’t do that anymore and have no plans to do it in the future but an engaging PvE endgame is still important to me. The problem is, we have no idea what that will consist of in ESO. No idea at all. A post over on the Elder Scrolls Online Reddit caught my attention today. Mrbluebird claims that the latest closed beta build has collision detection turned on. Obviously this is a single claim by someone on Reddit but, if true, it changes the game immensely. Mrbluebird says that he has verified it in PvE only and is unsure if it extends to PvP. What does this mean for ESO? Well, it should help alleviate the disconnected feeling that exists in melee combat. Players have complained that melee feels “floaty” and not quite right. I would agree to a point. Collision detection will certainly add weight to a melee swing. It would mean even more to the PvP side of things. Tanks would now be able to “physically” block opposing players from getting to the back lines and harassing healers and ranged DPS. Choke points will be even more important as a couple of tanks standing in a tight choke point will be able to stop a large group of players from advancing. There are a few downsides to collision detection. If not done correctly it can allow players to grief other players. This can be alleviated by only allowing collision detection between opposing players and allowing allied players to still walk through each other. The biggest downside is the added burden the detection places on the game client. This can negatively impact server lag and performance. If the trade off to have collision detection is a client unable to handle the large battles in AvA, then I am not sure that its worth it. If they can pull it off while making the performance hit negligible, then I am all for it. This is something that Warhammer Online had and it added immensely to the game. Entire strategies were built upon fact of collision detection. I enjoyed the added strategies that collision detection brought to the table and I hope to enjoy them in ESO. The character progression in ESO is pretty interesting. It is nice mix of the more free-form progression that you see in the single player Elder Scrolls games and standard MMO progression. You make your initial choices in character creation by choosing your race and your “class”. Your race will give you a single skill line that will give you bonuses such as increased swim speed or increased resistance to fire damage. Your class will give you access to three skills lines that are unique to that class. The nice thing about the class skill lines is that they do a good job of defining your character without pigeon-holing him. You might be a Templar but you are not stuck healing and you can specialize in ranged or melee DPS. There are a lot of options just within your class skills. But that is not the only skill trees you have. Not even close. Each weapon type also gets its own skill tree, as does each armor type. Because any class can use any weapon or armor, there are a lot of different options here. Your character can be a sorcerer that dual wields swords, wears heavy armor and has a dinosaur for a pet if you so choose. Or he can wield a two-handed sword, while wearing plate armor. There are few limitations in what you can be. Obviously, the big upcoming MMO release is Elder Scrolls Online. I had not paid much attention to it during development as I really was not ready for the disappointment that I just knew would happen. I have played all of the Elder Scrolls games from the start. Even with a bit of disappointment with Oblivion, I classify the Elder Scrolls games as the best single-player RPGs this side of the original Baldur’s Gate. I figured they would totally screw up an Elder Scrolls MMO by using the WoW template for everything and I just was not prepared for that. Hot key combat, quest hubs, standard character classes and raids to me is the anti-thesis of what made the Elder Scrolls games great. So, did they screw it up? Yes and no. Read on for some impressions. I finally got my new PC put together and am back at it and checking for Guild Wars 2 news, seemingly every two minutes. One of the first things I saw was Arena Net’s blog about micro-transactions and the cash shop. One of the second things I saw was all the whining and worrying from the GW2 ‘community’ about micro-transactions and the cash shop. I swear I don’t remember MMO fans whining so much and so easily back in the early DAoC days but maybe that is just rose-colored glasses? Anyway, the whining started immediately and has not ceased since. To further increase whining, yesterday leaked screens of the cash shop hit the internet, thanks to 4Chan. I am not going to post them here but you can find them easily with a google search. A little background on me, I have always been extremely leery of cash shops. I was burned once, with Allods Online, and I won’t be burned by them again if I can help it. Nothing kills my enthusiasm for a game as much as a cash shop that sells ‘pay to win’ items. I have no problem at all buying items on a cash shop but if there are items on there that make one person more powerful than another because he or she spent more money……..well, consider me out. Fact #1: Gear in GW2 is not equal to gear in WoW, Rift or LotRO. In Rift a character that just hit the level cap had a distinct disadvantage against a character that had been at level cap for a few months and done end-game raids or PvP. This gear discrepancy does not exist in GW2. Most gear is cosmetic, with very little difference in stats, and a fresh 80 will be able to compete against a character that has done all the high level content for the last few months. Fact #2: Levels and leveling in GW2 is not equal to levels and leveling in WoW, Rift or LotRO. GW2 has a mentor/sidekick feature that will allow low-level players to play higher level content with a high level friend. In PvP low level characters will automatically be boosted to the level cap to compete. In Rift, a level 15 could really only do content designed for his or her level, this is not the case in GW2. Fact #3: Much of the gear in GW2 is gained through Karma, which is not tradeable. The gear obtained through Karma is also not tradeable. Fact #4: All items on the cash shop can be bought with gold and not one dollar ever has to be spent in the cash shop. So, with that framework in place, let’s look at some of the items on the cash shop. Let’s find out where the whining is coming from. Experience Boosters: These are pretty self-explanatory. Buy one, use it and you get a x% experience boost for x amount of hours. These existed in Rift as part of their veterans reward. I didn’t mind them in Rift and mind them even less in GW2. Why? See Fact #2. Karma, Crafting Boosters: Just like the experience booster but boosts Karma gains and crafting gains. The crafting one does not bother me in the slightest. Gives you a chance to score bonus experience when crafting. Negligible. The Karma one does not bother me either. First, see Fact #1. After you see that one, take a look at Fact #3 and #4. Magic Find Boosters: People seem to be whining a lot about this one. Improves your chance to get a rare magic item when looting. This one would worry me but then I remembered Fact #1. Suddenly I am not really worried about it anymore. Loot Bag: Oh, no. This one says LOOT….it must be bad. Oh, never mind…..Fact #1. Gives one random item. Could be anything. A fool and his money are soon parted and all that….. Mystic Key: Unlocks one Mystic Chest. These drop randomly from kills. Okay, I don’t like this one. Not because I think it gives an advantage (see Fact #1 and Fact #4 people!) but because I think I will end up carrying around about 140 of these chests before I get around to opening them. Instant Repair Kit: Repairs your gear no matter where you are. Here come the conspiracy theorist! “The only reason Arena Net put repair into game is to sell these!’ Maybe but who cares? Fact #4 or go to town and repair, ya lazy git! Megaphone Broadcast: Broadcasts one message, server wide. Okay, I don’t like this. Not because it gives a competitive advantage but because it has the possibility to be really freakin’ annoying. The remaining items are all either cosmetic, give extra bank or bag space or have to do with account slots etc.. Again, not worried about cosmetic. Extra bank or bag space is nice but see Fact #4. I do find it cool that because of Fact #4, you can buy character slots, server transfers and maybe even expansion packs with in-game gold instead of actual money. That is pretty cool. Bottom line, coming from a person who hates cash shops, this cash shop is mild. It gives no competitive advantage to anyone. No matter what they spend. I could spend no money at all and destroy a guy who spent $200 in PvP and that is all I can really ask for. I have spent at least $10 dollars a month for a MMO subscription since 1999, I have no problem spending a bit each month. The glory of this cash shop is that I can still do that if I want to but I don’t have to and if I don’t, I can still play the game and not be at a disadvantage at all. Sure, someone may get more experience for a kill than I do, or get more Karma or be able to repair instantly but because of the facts above, it doesn’t matter. Who cares how fast I get experience if I can mentor up and play with my friends? Who cares if someone buys a random loot bag if gear is on an equal level? Who cares if someone can repair anywhere if I can go to town and repair or buy the ability to repair anywhere with in game gold? There is no Pay to Win here, people. It is much ado about nothing. No, I was not invited and for that I am sad. But I have watched a few hours of footage, read a novels worth of impressions and kept up with nearly all the various forum arguments. Through it all, I have continuously impressed by both Guild Wars 2 and ArenaNet. There has been some tremendous information that has come out in the last week and it almost has me frothing at the mouth. Below, in no particular order, are random impressions from the Press Beta. One would expect that a game called Guild Wars 2 might have a pretty robust guild system but this one takes the cake. All the normal options are there; roster, ranks, guild messages etc. but they have also added a bit to the standard MMO guild interface. Influence can be gained by every member by doing almost anything in the game. PvE events, crafting, PvP and WvW all add influence to the guild the character is representing. And that is where it gets interesting…. Influence can be used to buy everything from PvE political influence, to Keep upgrades in WvW, to Guild banks and Guild armor. Each upgrade, once purchased, has a ‘build time’ of anywhere from a few days to a week or longer. This can be reduced further by another influence purchase. All in all the guild system looks pretty involved and gives a Guild leader plenty of ways to administer and grow his or her guild. Check out this video for an in-depth look at the Guild system, courtesy of Guild Wars 2 Guru! The best thing I can say about the classes after watching video from the press event is that I am at an even further loss as to what class I want to play. They all look very fun. Heck, I hate mage style classes and the elementalist even looks fun to me. I think the clear winner coming out of the event was the Mesmer. It looks so fun and fresh. The abilities all have great animations and the stuff with the great sword is especially impressive. It looks like a very unique class. I think my favorite video I have seen with the mesmer is from mmogamer.es, which is a spanish language website. The video is supposed to showcase some instanced PvP but there are a couple of one on ones with a thief that are just awesome. Check it out and make sure to watch until the one vs. one starts! There were a ton of other nice class videos out there and, after watching them all, I think I am still leaning toward the Ranger. Unfortunately, there were few really good ranger vids out there. I think the best was this one by Curse Network. This is what I was most excited about by a long shot. Thankfully I was not let down. There was tons of video footage out there detailing WvW and most of it was fantastic. On paper GW2 is closer to Dark Age of Camelot than anything we have seen, including Warhammer Online. The maps are huge, the objectives are diverse and there is a lot of strategical depth to WvW. I love that the walls of Keeps can be knocked down and not just the gate. I love that the supply system adds some depth to sieges. I love that there are objectives all over the map and not just Keeps. I love that siege engines can be placed anywhere and not just on specified spots. I love the Relics masquerading as ‘Orbs of Power’. I love the look of the map. I love the trebuchets. I love the supply caravans. And I really, really love the siege Golems. Of course, this is all on paper and reality will eventually rear its ugly head. Will lag be too bad? Will players ignore the intricacies of the supply system and just zerg? 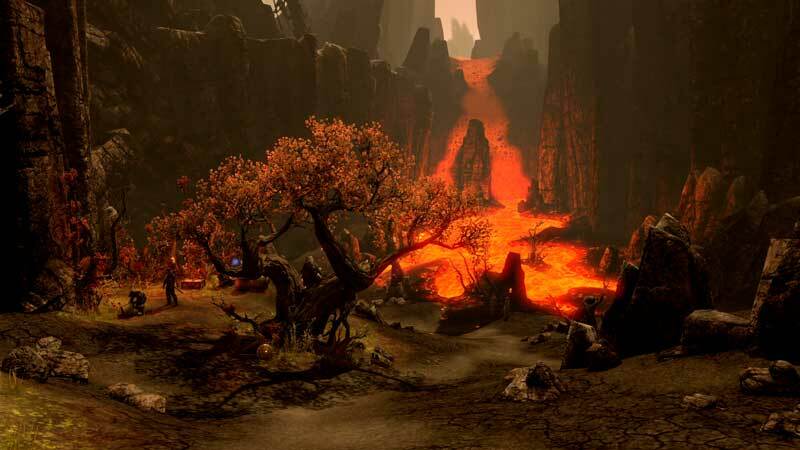 Will the instanced PvP content take precedence and make WvW an afterthought for players? Will players treat WvW like WAR players treated Keep sieges and only attack undefended Keeps? All of the above are unfortunate possibilities but most of them are community problems and not real problems with the game. Hopefully the systems in WvW will allow us to skip most of the above unpleasantries. The biggest worry I have is lag. There were a number of videos where lag was a major factor in WvW and nothing kills large-scale PvP like lag and performance issues. Luckily ArenaNet has said that they are still heavily optimizing the engine and we should see major improvements by the next beta event. Even with that fact, I did see some videos with a noticeable absence of lag. The best probably being the one below from Yogscast. I am going to wrap this post up for the night. However, expect more from me tomorrow about Guild Wars 2 and focusing on PvE, Dynamic Events and the Tombs of Ascalon instance!